Last fall, San Francisco restaurants’ social media feeds erupted in all shades of orange and umber: hoshigaki had arrived. 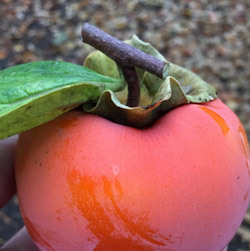 In stunning Instagram photos, chefs like Bruce Hill of Fog City, Corey Lee of Benu, and Chris Bleidorn of Saison documented the Japanese practice of peeling, drying, hanging, and hand-massaging hachiya persimmons, a fall delicacy. Farmers like Boonie are on the ground with the nearly 400 chefs shopping regularly at the Ferry Plaza Farmers Market, working with restaurants to set trends and transform menus. K&J has seen their restaurant business steadily increase since CUESA’s market returned to the Ferry Building in 2003. The farm now has more than 50 regular restaurant clients, accounting for more than half of their business. “It’s taken a lot of time, work, and tender care to cultivate those relationships,” says Boonie. For the chefs, K&J carefully cut the hachiya stems just right so that they could be strung up for hoshigaki. K&J caters to chefs in other ways, by experimenting with crops that they suggest from their travels or by fulfilling special requests. For example, K&J has been harvesting aromatic fruit leaves (fig in the summer, citrus in the winter) for Cotogna, which they use in a baked ricotta dish. “Everyone kind of gets bummed out on root vegetables in the winter, but we try to embrace and showcase them,” says Cooper from Aster. He has been big on salsify from Tierra Vegetables, which he poaches, roasts, and serves with wild mushrooms. “It’s kind of hard to cook but it’s really delicious,” he says. 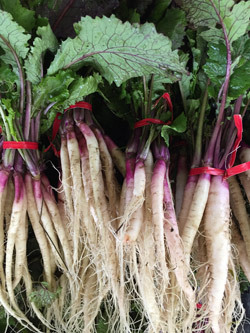 Tierra grows two types of salsify, both with earthy, sweet flavors: the more common white variety and a darker variety, known as scorzonera, which chefs have been especially enamored with (Michael Tusk of Quince is rumored to have served it to President Obama during one of his visits). Farmer Lee James says scorzonera is hard to grow and clean, with its many tiny root hairs, but she’s also seeing chefs gravitating toward other rare or underappreciated roots that are easier to cultivate, like sunchoke, celeriac, parsnip, and burdock. Preserved citrus: Farmer Bill Crepps of Everything Under the Sun is constantly experimenting with new fruits and vegetables to dehydrate. 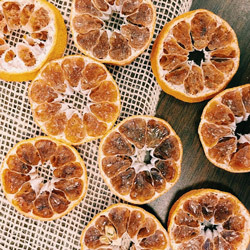 Enjoy citrus year-round by making his dried citrus slices or ground zest part of your pantry. Meanwhile, June Taylor is candying all manner of citrus peel, from blood orange to Star Ruby grapefruit to Sudachi lemon. Plant-based proteins: While beans aren’t new at the farmers market, they’ll be coming up in a big way in 2016, which the United Nations has declared the International Year of Pulses. Appreciate legumes in all of their heirloom varieties at Tierra Vegetables, Iacopi Farm, and Lonely Mountain Farm. Ancient grains: You’ve probably heard of farro, but how about spelt or emmer? Stop by Rancho Llano Seco to give these nutty and nutritious whole-wheat grains a spin. Microbiome-friendly foods: Food crafters have been preaching the magic of fermented foods for years now, and scientists and the mainstream media are finally taking notice. Farmhouse Culture, Saint Benoit Creamery, and Eatwell Farm have probiotic kraut, kimchee, yogurt, and lactofermented “softers” to feed the critters in your gut. Ugly fruits and vegetables: As consciousness about America’s food waste problem continues to grow (approximately 40% of food is lost between farm to plate), ugly produce has become the social media mascot for food recovery. Putting an end to food waste means embracing the delicious but gnarled and warty fruits and vegetables that don’t see the (fluorescent) light of grocery store shelves. Crazy Carrots, 2016 is your year to shine! Hoshigaki photo by Alan Hsu of Benu. Persimmon photo by K&J Orchards.